McCrory, L. 2008. Feature Farm: Diversified NH farm ships first organic milk. Northeast Organic Dairy Producers Alliance. Vol. 8, No. 3. (Available online at: http://www.nodpa.com/ff_April_2008.shtml) (verified 21 Jan 2009). There are a growing number of organic dairy farms cropping up in New Hampshire; from five certified dairies in 2006 to 12 farms in 2007. While this number may not seem like a lot, organic dairy farms represent 9% of the 140 total dairy farms in the state. Luke and Catarina Mahoney, with their growing workforce, Oliver (5) and Emanuel (2), operate an organic dairy farm located a short distance from the University of New Hampshire in the town of Rollinsford. They rent their 500 acre farm, including 70 acres of pasture, 60 tillable acres, and 200 acres of wooded land. Luke and Catarina grow baleage and plan to grow some small grains in 2008 to complement the forages that they are growing, hoping to reduce the need for purchased feed. Brookford Farm's Luke and Catarina Mahoney and family. Photo credit: Lisa McCrory, Earthwise Farm and Forest. Brookford Farm is conserved. Their rental agreement includes the land, house, barns, equipment, milking parlor, and three tractors. Though much of what was provided needed some attention, it was a perfect opportunity for the young couple to get started with their own dairy herd. Luke and Catarina are in their first year of shipping organic milk, but they are not new to the world of organic dairy farming. Luke has worked on a number of dairy farms over the past ten years; from a biodynamic, social/therapeutic working farm in Pennsylvania to other biodynamic farms in Germany and Russia. Luke and Catarine first met at Svetlana Farm in Russia where Luke worked on the dairy and Catarina worked on vegetable production. With their combined experience in animal husbandry and vegetable growing, the Mahoneys plan to diversify their farm and sell meat, vegetables, and eggs to local markets and through their farm store, adding to the milk income they receive from Organic Valley. All the farms on which Luke and Catarina have worked are biodynamic and organic and they apply many of the management practices and philosophies they've learned to their own farm. They keep the horns on the cows and as time goes on, plan to apply biodynamic preparations on the fields and to the composting manure. First, however, Luke would like to build the herd to match the appropriate number of livestock on the farm (fertility source) with the land base (fertility needs). The farm that the Mahoneys are renting was already certifiable and the cows that they purchased were certified organic, so they did not have a transition process to manage. They had some up-front costs to purchase livestock, ensure that the land was certified, and the house, barns and equipment received the necessary tune-ups and upgrades. 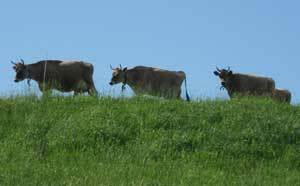 They purchased cows from two organic dairy farms located in northern Vermont: Butterworks Farm in Westfield and the Norris Farm in Canaan. From this start-up herd of 15 cows (first lactation) and 13 heifers, Luke and Catarina will grow their herd to a number they consider to be sustainable for their land base and personal needs. The farm is certified by the New Hampshire Department of Agriculture, Markets and Food and they have been shipping milk to Organic Valley since May 2007. Farming organically in Europe is very different from organic farming in the U.S. As an example, antibiotics were allowed for use on the certified organic German farms on which Luke worked provided they were vet prescribed. Their vet friends in Germany cannot believe that animal health without antibiotics is possible. Luke and Catarina have had to learn about approved livestock health and management practices under the USDA standards. This has not been as challenging as they thought it would be. "It is amazing how well they can come up with solutions if you say 'no' to antibiotics," said Luke. During the winter months, the cows are housed in a bedded pack. Weaned calves and bred heifers are kept in a freestall barn. Calves, newborn to weaning age, roam freely in a bedded pack with access to the south. Reed canary grass from a nearby certified organic farm has proven to be a great bedding source and they continue to look for abandoned fields for additional bedding in the coming year. The Mahoneys have long paddocks or "pasture strips" that they use, giving the cows a new section of grass after each milking. Some of the strips are very long and the cows may be on it for a week, so they try to use a back fence whenever possible. Water is made available in each paddock using black plastic pipe and portable water tubs. The cows have grazed well into November on winter rye the Mahoneys planted. 2007 was the first complete grazing season on this farm. Because the farm had not had animals for some time before the Mahoneys arrived, the pastures were very weedy. With their grazing plan in place, they are looking forward to seeing how the pastures fill in, and also plan to sow red and white clover to the pastures through frost seeding or no-till application. They have considered adding lime to the land but at the same time are focused on increasing soil biology so that soil organisms can make calcium and other nutrients more available to the plants. Biodynamic preparations will play a role in making this happen. To supplement the pasture, cows are offered free choice of hay, kelp, salt, and six pounds of a 12% protein high energy grain. In the winter, the dairy cows are fed first cut alfalfa silage and second cut alfalfa mixed grass hay, eight pounds of an 18% grain, free-choice kelp, and Redmond salt and conditioner. Heifers and dry cows get pasture, salt and kelp (no grain). In the winter, they get first cut dry hay, and alfalfa baleage. Cows at Brookford Farm. Photo credit: Lisa McCrory, Earthwise Farm and Forest. Calves receive milk up to four months of age. Along with milk, they get calf starter grain and high quality second cut of hay/grass/alfalfa. Early weaned calves get 18% calf starter with whole oats and molasses plus some high quality hay. Weaned heifers get 1.5 pounds of a 14% grain plus the same forages ration as bred heifers and dry cows. A major part of their approach to livestock health is a good prevention plan. Cows are not pushed for production and are fed a high forage, low grain ration. They offer free choice kelp, salt and conditioner to their cows and have chosen not to vaccinate their cows unless there is a problem. Calves are left with their mom for the first seven days of life. Cows and calves stay together in the barn at night and the cows go out to graze during the day (during the growing season). The cows are still milked two times a day. Health problems such as mastitis, calving issues, and milk fever have not been an issue on the farm. There were a few nervous heifers, however, who were not breeding back right away and have had good success with Spectra 305. The heifers started showing their heats and many were bred in the first breeding. Luke is a regular contributor to the Odairy listserv. He uses it to learn from other farmers, veterinarians and professionals as well as an avenue to buy and sell feed, livestock or other things of interest to the organic dairy crowd. He also turns to Dr. Hubert Karreman's book, "Treating Dairy Cows Naturally;" Dr. Paul Detloff's book, "Alternative Treatments for Ruminant Animals;" Ehrenfried Pfeiffer's book on soil fertility; and "World of the Soil" by Sir E. John Russell. The Mahoneys are actively looking for veterinarians interested in working with organic livestock operations. Their current vet, though not supportive of organic dairy, is very interested in management and comes to the farm for herd checks and emergencies. Luke and Catarina have felt the impact of the current grain and fuel prices. They agree that the pay price for organic milk needs to be addressed. Though the price for organic milk was fair a year ago, it is no longer sustainable. The Mahoneys are interested in growing more of their own feed and are looking into equipment, attending workshops and networking with other producers in preparation for the coming growing season. Brookford Farm is doing more than selling organic milk. Realizing the interest and demand for locally grown products, they have started to market their cull cows and bulls as organic beef, sell eggs, and plan to grow increase their vegetable acreage. These products are sold at the store-front on their farm and at local farmers' markets. They feel that the more diversified they are, the more likely they can remain viable and live the lifestyle they desire on their small farm. McCrory, L. 2008. Feature Farm: Diversified NH farm ships first organic milk. Northeast Organic Dairy Producers Alliance. Vol. 8, No. 3. (Available online at: http://www.nodpa.com/ff_April_2008.shtml) (verified 20 March 2010).